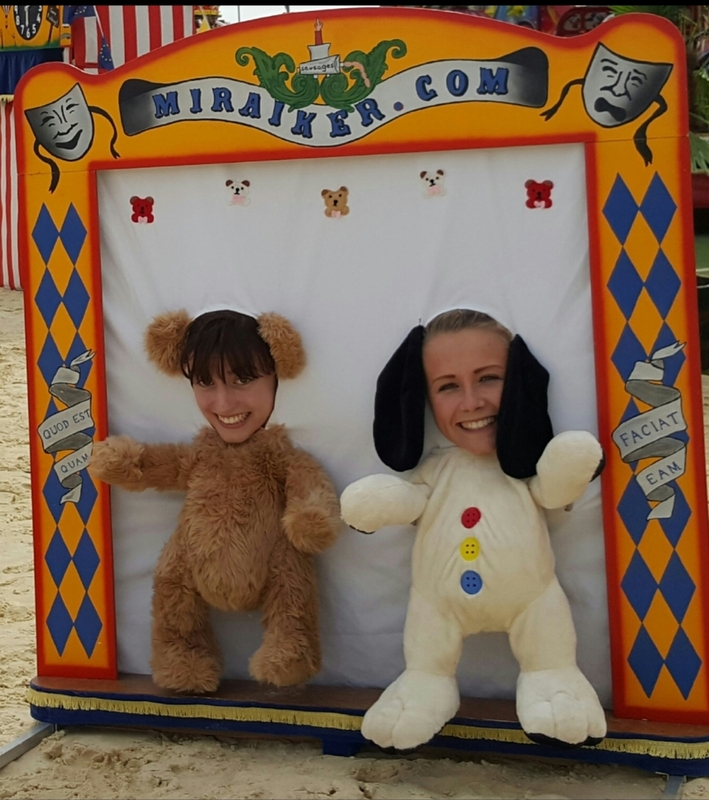 Miraiker's Punch & Judy booths are designed to make performing easier for you and use her years of performing experience to eliminate all the difficulties that come with many booths. Unique flashing system preventing the rain coming into the booth. Drop bag that doubles up as a bag to carry puppets or booth cover. Playboard that makes playboard droop a thing of the past. 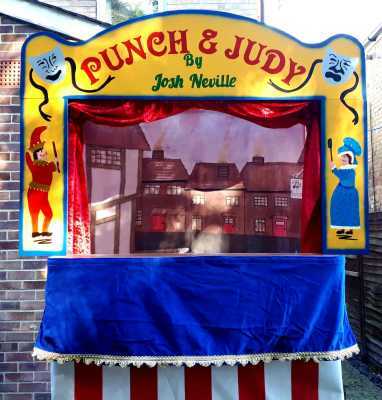 Puppet bars on the front and both sides with plenty of hooks. Ties at the back to keep out inquisitive children. 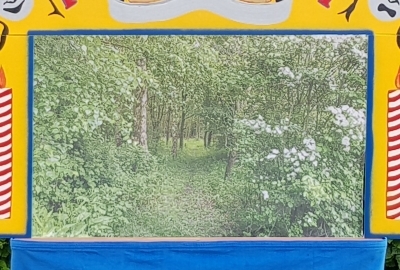 See through picture scenery (choice of ref. O.B. or P.T.- see scenery gallery below) with blackout behind so you can't be seen. 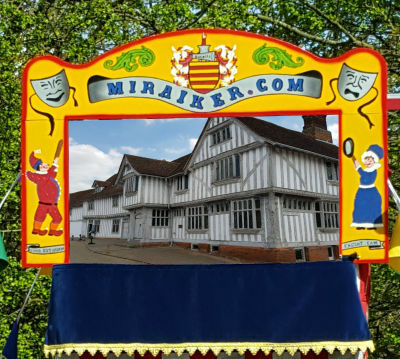 Hole in the playboard for use of Miraiker's props such as the sausage machine. 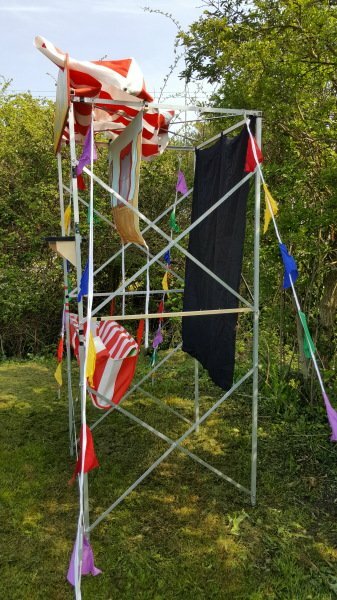 Ropes with adjustable slides, metal pegs and fixings on booth to attach the ropes to. 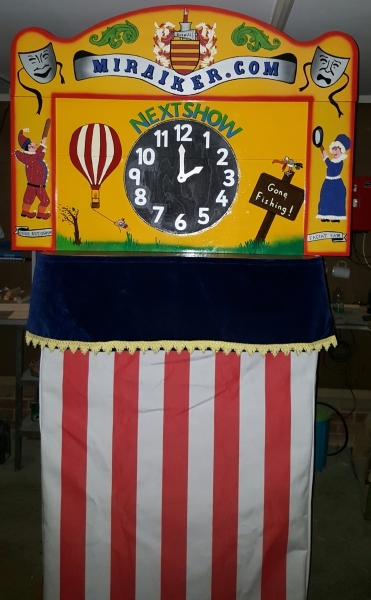 Security board to close the proscenium opening between shows which features a Next Show clock that doubles up as a blackboard for writing messages. 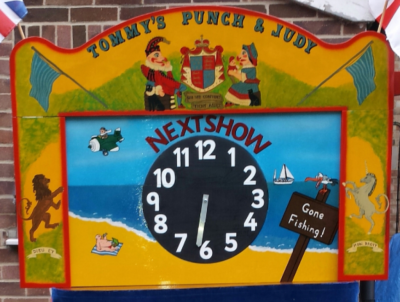 Separate Next Show clock . See "Props and Accessories" section for sound systems. It's really a matter of personal preference. 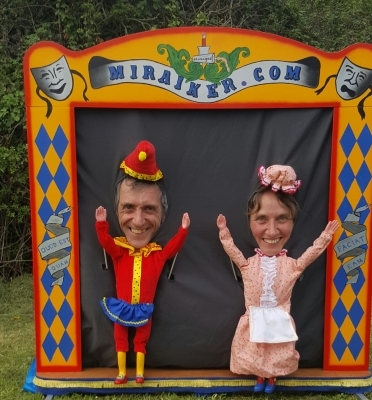 Miraiker uses an aluminium frame herself because it folds into a smaller bundle and is more light weight than a wooden booth. Others prefer using a wooden frame but either works great. 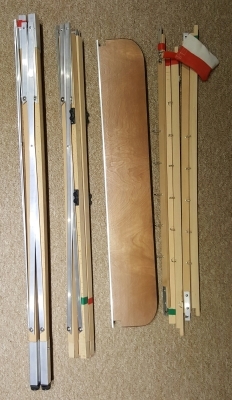 The latest wooden design, pictured left unpainted, uses beech uprights with aluminium cross pieces to make the lazy tong fold neater and stronger. 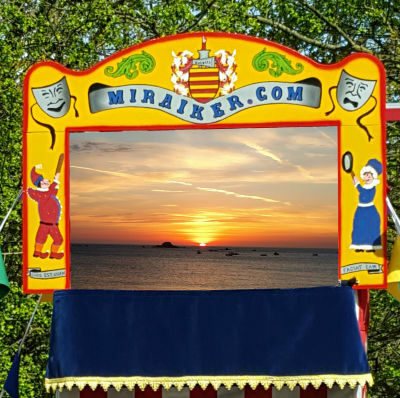 Miraiker is happy to discuss your artwork with you and work with you on your own ideas, or you can leave her to it and she will design your proscenium for you. Every booth is unique. You can choose to have your name on it if you wish. You can have a traditional look or something special to you. Click on the gallery below to see a selection of the wide range of prosceniums that have been commissioned. Some have travelled further than others! 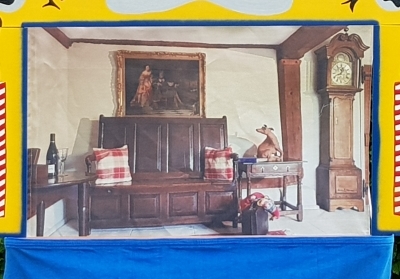 Complete with clock and curtains. 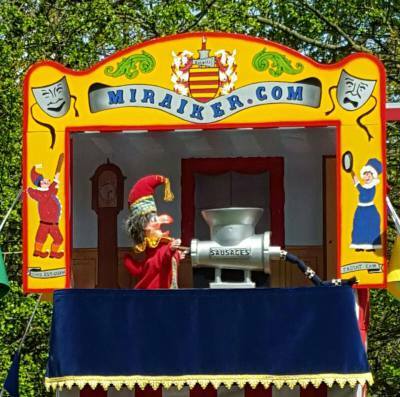 Germany's answer to Mr Punch. Supplied primed and ready to paint. Mr P gets himself all in a twist! Definitely not the final curtain for this old booth! Keeping the theme of the existing website. I loved painting the green man even though Judy doesn't look very pleased with it! A young and up and coming performer. Not just a drop bag! 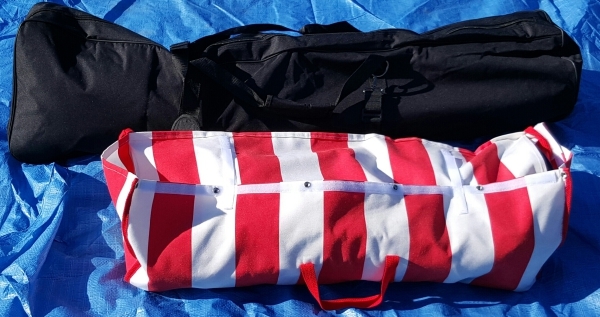 Shown below left is a lazy tong booth packed in a golf bag along with Miraiker's dual purpose drop bag containing the cover. The open drop bag in the booth can be seen ready for action below right. 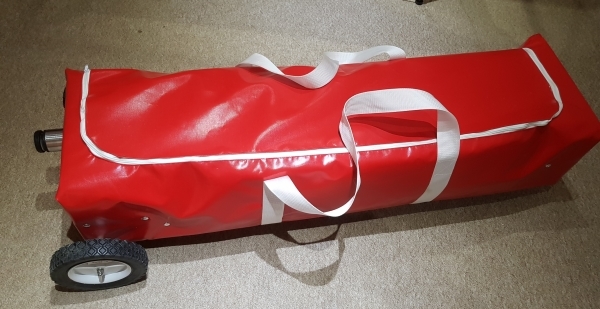 This drop bag is supplied as standard with every full booth. 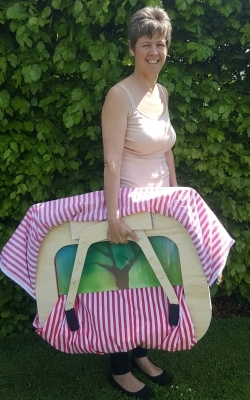 The booth in a bag lets you reduce the number of trips from the car or makes arriving at your show by public transport entirely feasible. 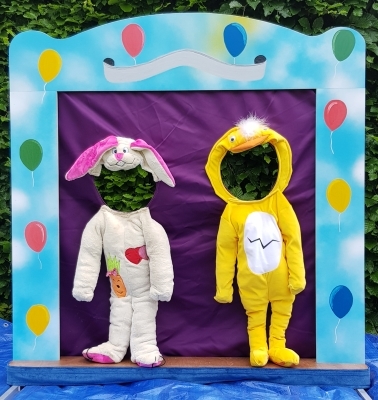 The wheeled trolley is designed for a standard aluminium booth and will hold everything supplied with that booth so all you need to bring along is a bag of puppets! 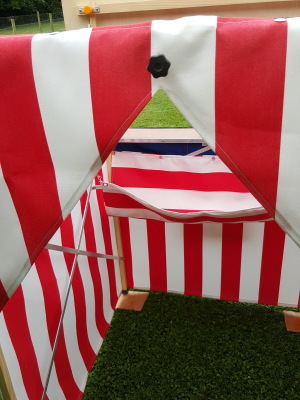 It is available in a red and white canvas finish to match your booth or in the more weather resistant, striking red vinyl finish shown below. 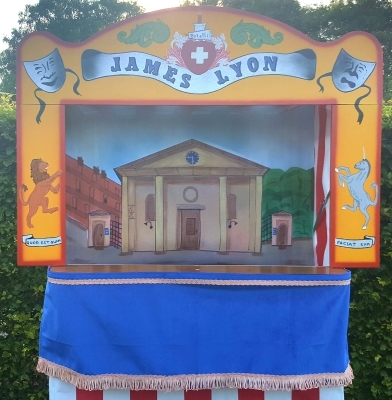 The foot on the end of the trolley allows it to be stored vertically when not in use taking up minimal storage space either at home or at your show. 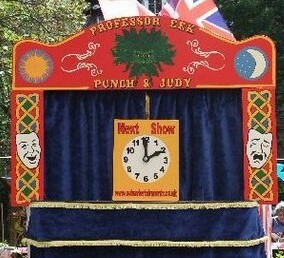 When Miraiker performs other puppet shows she uses the same booth as for Punch & Judy, but it looks completely different. Instead of having two separate booths the same frame can use a different cover, Miraiker uses green for her traditional stories. 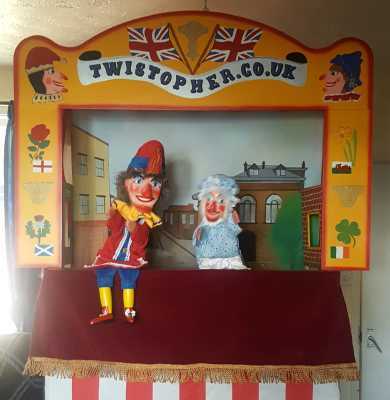 The side pieces of her Punch & Judy proscenium feature Mr Punch and his wife so she has a second pair with clowns on for her other shows. She has different sceneries depending on which show is being performed. 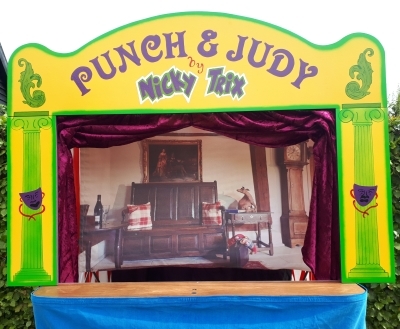 You can have an adaptable booth so that you can switch between shows with a new look. Ask Miraiker how she can help with your booth requirements. Check out the gallery below for some examples of sceneries available. Beach theme - ref. SS. Woodland theme - ref. WT . Great for Little Red Riding Hood. Indoor theme - ref. OB. Halloween theme - ref. WB. Even the clouds are spooky! 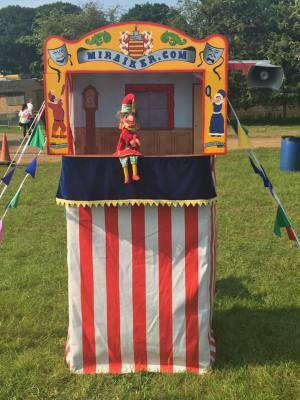 The sun never sets on Mr Punch! Suffolk street theme - ref. PT. Where Mr P calls for a sly pint on the way home! Lady Street - ref. LS. This really is not where Judy lives! 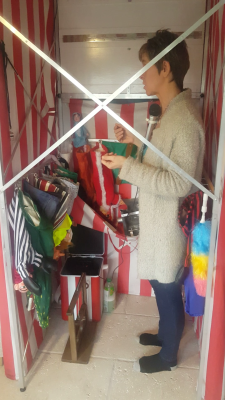 Have you an old booth that is not fit for purpose? 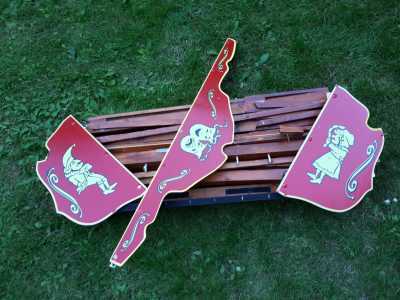 Perhaps it needs a new cover or it doesn’t fold properly or the playboard is now more like a puppet slide! Maybe you want to convert from hands above head to hands in front of face. 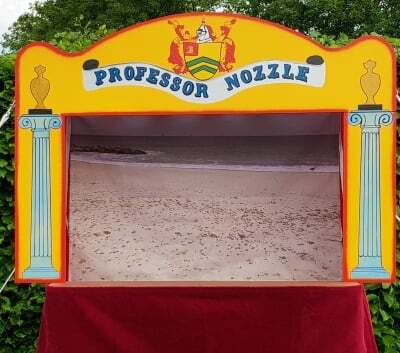 Do you need a new proscenium or paintwork or some of our brilliant see through scenery? Whatever the problem help is at hand. 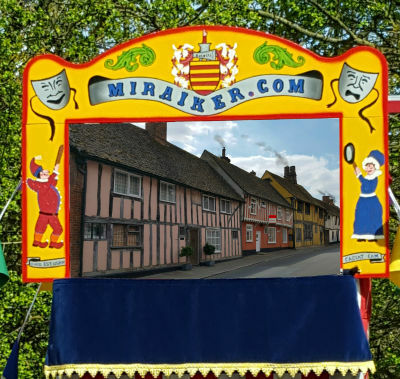 With years of experience of building and repairing booths and sorting out other makers’ mistakes Miraiker can provide a solution. Call to discuss a budget for the work that needs doing. 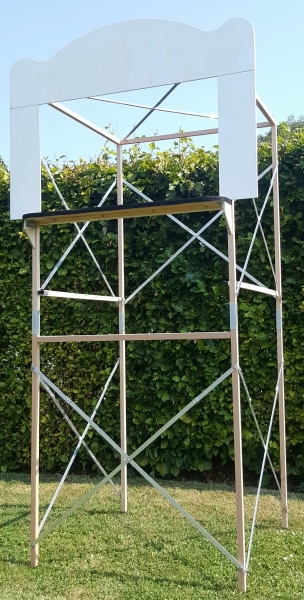 ​As an example of what can be achieved take a look at the bundle of badly fitting components of a "hands above head" frame which was sent to us shown on the left . 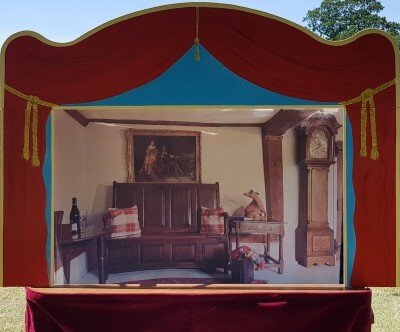 With a little thought, a new cover, playboard, some size adjustment, new scenery and proscenium this old beauty is now ready to work for many more years as a more modern "hands in front" booth. ​A totally different concept for those of you requiring the ultimate in fast assembly. 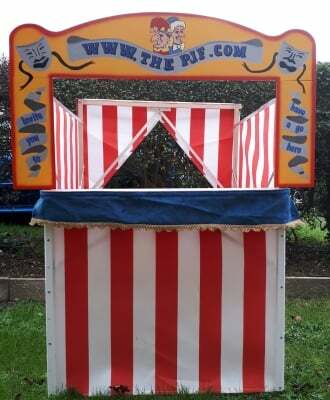 Great for parties, queue entertainment or as a crowd builder for your main event. It makes getting to the show by public transport entirely possible. 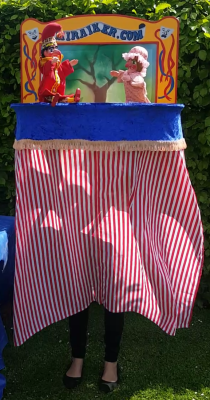 This comes as shown and complete with puppet hooks and drop bag (puppets not included). Click on either picture to see it go up. 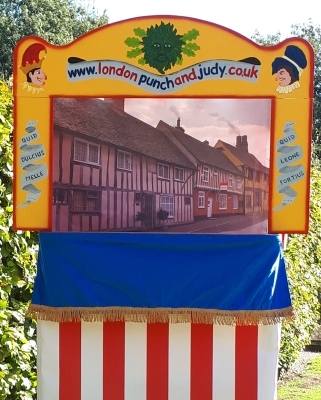 When you perform your Punch and Judy show the children always want to have a go. It's only natural. This booth is just the right size to allow them to do so without letting them into your own booth. 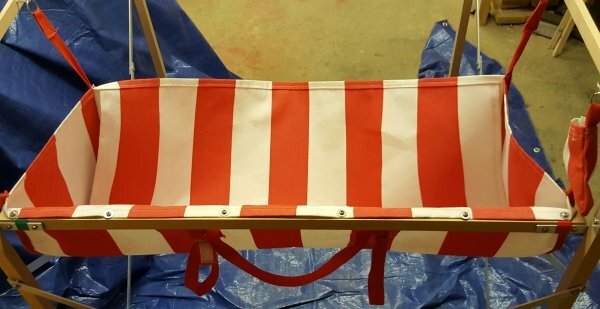 It is easily built in under 5 minutes and can be carried in one hand. The top is open so that parents, teachers and you can keep an eye on what's going on inside. A drop bag is included to keep the puppets they are using off the floor. Click here to see a video of it being built up. 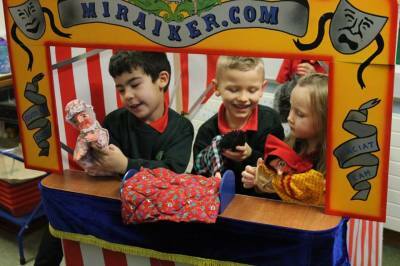 Get some great audience involvement with our "Live puppet show". 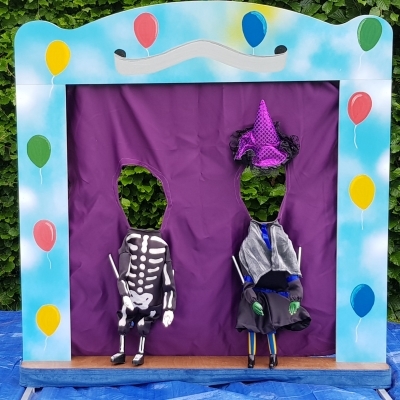 Young and old alike can have great fun pretending to be Punch and Judy or other characters in the "Live puppet show" while friends take their picture and post a lasting memory on social media.​​ Check out the gallery below to see the inserts that have been made so far. Or come up with your own ideas. 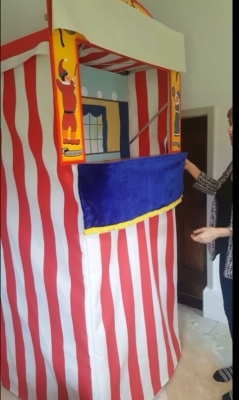 Click here to see the assembly of the wooden booth. Please note that my wooden, lazy tong booths are now made with aluminium cross pieces for added strength and smaller folding. Click here to see the assembly of the aluminium booth. Click here to see the loaded booth ready for action. 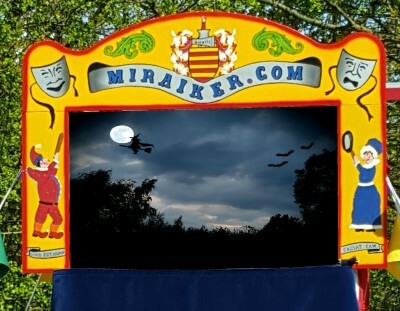 ​Click here to see what you get when you buy a booth from Miraiker. Full booth, ready to go and including everything mentioned in the "All Booths feature" section above. 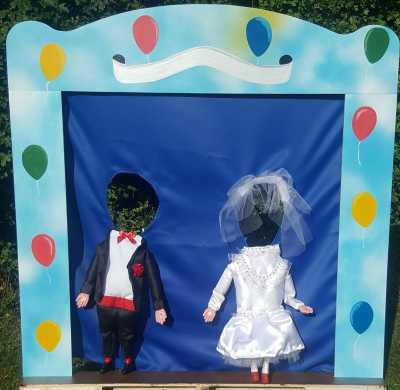 Click here to contact Miraiker for more information or to order a booth.